The recipe below calls for a loaf pan, a far better baking option than the square baking pan I used for the above. 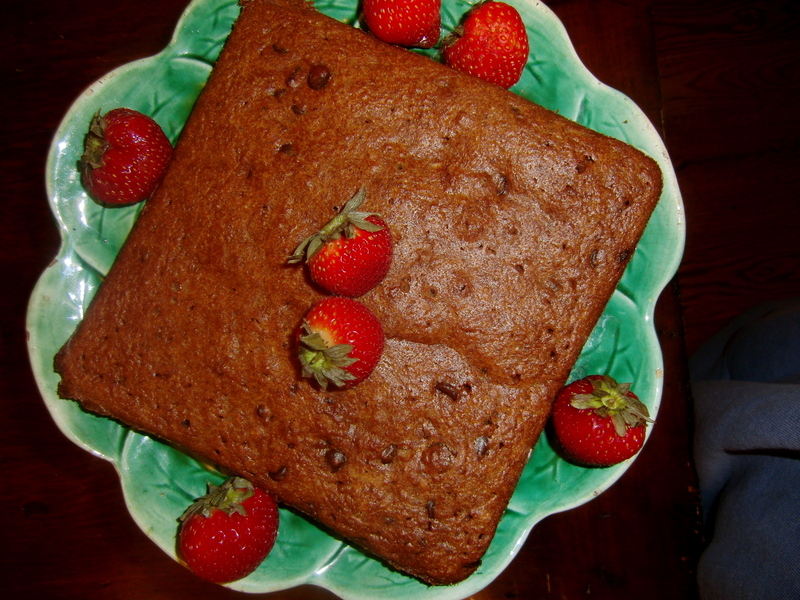 The cake is more moist in a deeper baking dish. I don’t consider this a breakfast cake, nor a true dessert, but rather a mid-afternoon chocolate-fix. Do not be put off by the amount of applesauce… it is a very mild flavor amidst the chocolate. Recipe: Preheat the oven to 350 degrees. Lightly grease a loaf pan with oil (I drizzle a little canola oil on it and spread it around with a baggy). In a medium bowl, whisk together the flour, sugars, baking soda, cinnamon, salt, and pepper. Whisk in the eggs, canola oil, and applesauce. Make sure the melted better has cooled before you whisk it into the mixture. Use a rubber spatula to fold in the chocolate chips. Pour the mixture into the prepared pan. Note that it will not be the color of chocolate until after it is baked. Bake for 1 hour and 15 minutes. Let the cake cool in the pan for 10 minutes before inverting it onto a serving platter. Let it cool for about 20 more minutes before slicing.